A pressure cooker may seem like an old-fashioned cooking method, but they have come back in style in a big way. With society becoming so health-conscious, we’re constantly trying to find new and innovative ways to prepare healthy home-cooked meals somewhere during our hectic lifestyles. What makes a pressure cooker the ideal solution is that it is a fast and healthy way to prepare a variety of meals, and it literally takes the pressure out of cooking. So whether you work long hours, or just don’t see yourself as the next Masterchef, we encourage you to jump on the pressure cooker bandwagon and see how it can revolutionise meal times for you and your family. It has been said that these handy gadgets can shave off up to a third of cooking time, and in turn, this also lowers your carbon footprint by around 70% as it uses less electricity, gas and water than any other kitchen appliance. A pressure cooker also allows you to minimise mess and effort by containing all meal prep in one pot. Simply add water and wait. You’ll benefit from trapping every last drop of goodness in your ingredients for a more flavoursome and nutritional meal. There are different types of pressure cookers on the market depending on what equipment you already have in your kitchen. You can get stove top, electric or even microwave pressure cookers; all of which do exactly the same thing with some taking longer for certain recipes. Whichever one you choose, it will always be a faster, healthy alternative to other methods of cooking. If you’re short on space, there are pressure cookers that can double as other appliances such as a rice maker, steamer or slow cooker. If you hate slaving over a hot stove then an electric option allows you to leave it to its own devices while you get on with other things. However for the technophobes or those who simply enjoy cooking, you may prefer a stove top cooker for trying out new recipes and cooking styles. Microwave compatible options are ideal for students who may not have the time, space or enthusiasm to cook. This will ensure a hassle-free way to get their 5 a day. If you’re a traditional family who gathers around the table for some good old-fashioned home cooking, then the Instant Pot Duo 7-in-1 Electric Pressure Cooker is a must-have for your kitchen. This multi-tasking marvel, easily our best pressure cooker for families, can also be used as a rice cooker, slow cooker, yoghurt maker, steamer and much more. You’ll never be stuck for what to eat when you’ve got this handy gadget on your kitchen counter. We know how hectic being the head of a big household can be, but with the safety features and easy to use interface, you’ll get the chance to sit back and relax while the dinner’s cooking or delegate to other family members. Want to give healthy eating a go but don’t know where to start? The Tower Sure Touch Pressure Cooker is a great first time buy with its low price and simple design. This is one of the best pressure cookers for stove tops and it is compatible with all hob types. It looks and feels like your average pot and is as simple as boiling something in a pan. This difference is you’ll have a pressure indicator and 30 minute timer which makes for a quick and easy cooking experience; even for complete beginners. You’ll even get a recipe book and clear instructions to get you started. Although on the pricey side, this interactive pressure cooker will become your new best friend in the kitchen. This cooker works alongside an app in which you can choose from a number of recipes and it will tell you all the ingredients you need. Not only that, but it will automatically set to the correct temperature and set the time. This really is the future of cooking. 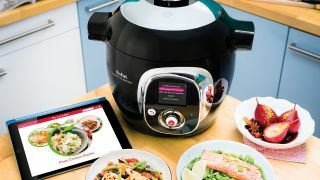 If you enjoy home-cooked meals but hate the prep, the Tefal Cook for Me Connect Multi-Cooker is like having your very own personal chef. You’ll also be pleased to hear that it’s dishwasher safe for stress-free cooking. If it’s time for your pride and joy to fly the nest then why not give them the gift of home cooking made easy with this microwaveable pressure cooker. We know that the last thing on your mind when going off to university is how to get your 5-a day, but with the Lakeland Microwave Pressure Cooker you’ll be able to cook your meals quickly and easily (and maybe pack in those veggies too) and still have time to go out with your mates. This is an entry-level pressure cooker that won’t break the bank, so if you’re not convinced by the fancier options this is a great option to start out with. It even comes with 23 recipes if you’re stuck for inspiration. If you’re a keen cook who’s always trying out different recipes but don’t want to splurge on millions of different kitchen gadgets (who has a kitchen that big!?) then the Pressure King Pro 5 is the best value for money pressure cooker on the market. Its 12-in-1 functionality means you can use it as a steamer, slow cooker and warmer as well as use it for sautéing and browning off ingredients for a professional finish even Gordon Ramsay would approve of. It also has a super-sleek look and compact design which makes it a must-have appliance for foodies. This cute little pot is one of the best pressure cookers for small kitchens, but still provides a 3L capacity which is ideal for small families or couples. This kitchen appliance can easily be stored in the cupboard and brought out at meal times or wouldn’t invade your kitchen if placed neatly on the countertop. Cook tender meats, stews and curries with its two pressure settings that allow for versatile meal prep so you’ll never get bored. This stove-top pressure cooker is suitable for all hob types and the pan and lid are oven safe up to 180C; perfect for keeping things warm before serving. Do you want to see what all the fuss is about but don’t have the cash to splash on a high-tech kitchen appliance such as the Cook4Me Connect? Then this trusty Morphy Richards Pressure Cooker is a great place to start. As it's from a reliable brand, we recommend this pressure cooker as a first-time buy that will stand the test of time. It has a medium capacity which is perfect for couples or smaller families and is compatible with all hob types, including induction. It may not have all the mod-cons of some of the more techy products, but it does what it says on the tin.